The Queen has given a Turkish Cypriot campaigner a top award for her efforts in tackling human trafficking and modern day slavery. 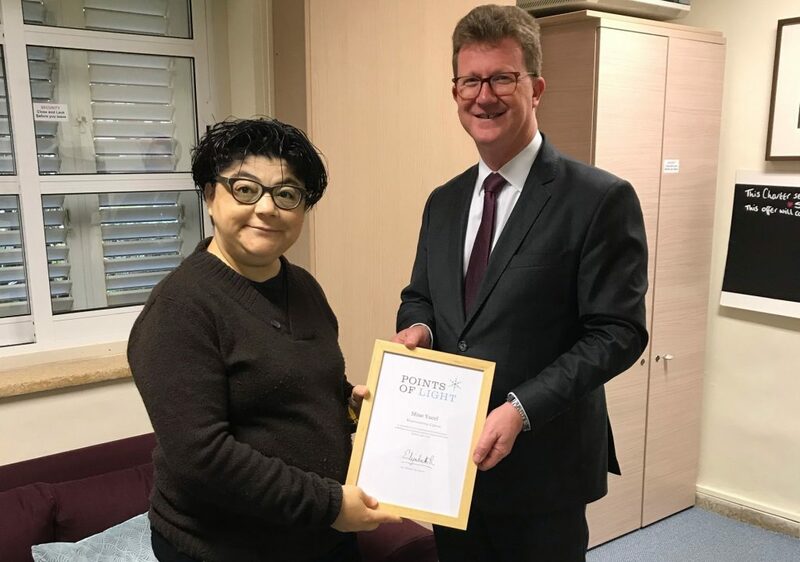 British High Commissioner to Cyprus Stephen Lillie presented Mine Yücel with a Commonwealth Point of Light certificate signed by Her Majesty Queen Elizabeth II. The Commonwealth awards scheme was launched last year as a “continuation” of a UK-wide version which began in 2014 and which was inspired by the US Points of Light programme established by the late President George H. W. Bush in 1990. It aims to recognise “inspirational volunteers” throughout the Commonwealth “for the difference they are making in their communities and beyond”. One volunteer from each of the 53 Commonwealth countries was recognised in the days leading up to the Commonwealth Heads of Government Meeting (CHOGM) in London in April 2018. The Queen then decided to continue the programme by handing out an award to one volunteer from each Commonwealth country every week in the run up to the next CHOGM, in Rwanda in 2020. Ms Yücel was named in January by the UK as the “85th Commonwealth Point of Light”, an announcement by the British High Commission (BHC) said. “Working with local authorities, the private sector and civil society, Mine uses her expert research work to raise awareness of migration and human rights, with a strong focus on tackling child labour and the exploitation of agricultural workers,” a BHC statement said. “Mine has been a leading voice on numerous panel discussions and publications about human trafficking, drawing attention to the current situation in northern Cyprus. Ms Yücel said that she was “honoured and very happy” as she received her award from Mr Lillie. “Usually those of us in the civil society feel invisible and get discouraged that nothing we do gets seen, appreciated, or recognised,” she said. “Those who need to see our work and get moving are usually the ones who remain silent and indifferent. “Sometimes things are worse, you get threatened and disheartened for the work you do. In short, most of the time you feel completely alone! “It is sometimes small things like appreciative words from the public, someone recognising you on the street and telling you to keep going, or very important and humbling things, such as awards like this, especially those as prestigious as this one that help you keep going. “You realise, someone out there is watching, and appreciating the work you are doing. Ms Yücel is the first Turkish Cypriot to receive a Commonwealth Points of Light award. The first person from Cyprus to receive the award was Greek Cypriot environmental activist Klitos Papastylianou in March 2018. People smuggling has become a growing problem in the Turkish Republic of Northern Cyprus (TRNC), which has been criticised by international observers. A 2018 global report by the US State Department said that the TRNC continues to be a “zone of impunity” for human trafficking. 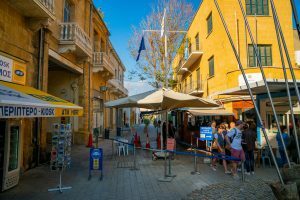 It claimed that the Turkish Cypriot authorities were “complicit in facilitating trafficking” and that the police “continued to retain passports upon arrival of women working in nightclubs”. Most of the women coming to the TRNC to work in ‘nightclubs’ came from Moldova, Morocco, Belarus, Russia and Ukraine, the report said. They are required to submit themselves to weekly health checks for sexually transmitted infections, even though prostitution is illegal in the TRNC, suggesting a “recognition and tacit approval of the prostitution industry”. Labour trafficking victims originate from Nigeria, Zimbabwe, China, Pakistan, Philippines, Turkey, Turkmenistan, and Vietnam, the report added. In February last year Lefkoşa Mayor Mehmet Harmancı ordered the closure of four unlicensed nightclubs in simultaneous swoops. That was followed in March by a TRNC-wide government crackdown after a Belarusian “hostess” died after being found unconscious in an upstairs room of a nightclub. 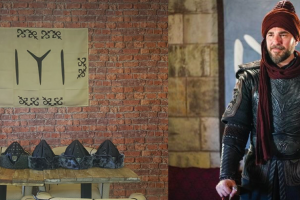 The action was launched after Interior Minister Ayşegül Baybars promised to put an end to “illegalities” and “human rights abuses” at the establishments. She promised at the time to step up inspections and vowed to close “legal loopholes” preventing her ministry from “taking action”. Labour and Social Security Minister Zeki Çeler had also said that he would do his “utmost” to address “problems” at the nightclubs.